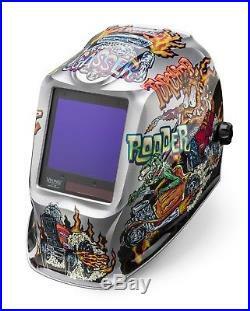 Lincoln Viking 3350 Hot Rodders Welding Helmet K4440-3. Welding helmets with external shade control for all welding processes. VIKING 3350 auto-darkening helmets are solar powered and loaded with features. Get a free helmet bag and bandana. The Lincoln VIKING 3350, our top-of-the-line helmet series, provides the best optical clarity available in a welding helmet today and the largest viewing area in its class. The Lincoln 3350 Series welding helmet offers a pivot style headgear designed for greater comfort and optimal fit. Largest viewing area in the VIKING line. Superior comfort with the pivot style headgear. The new 4C ADF Technology improves the performance of the lens in the 4 most important categories to the welder. Clarity - Optical Clarity 1/1/1/1. Color - Real Color View. Cut - Even Shade From Any Angle. The 4C Lens Technology upgrade to Lincoln Electrics VIKING welding helmets improves visibility and reduces eye strain by minimizing the traditional lime green coloring in the helmet view screen. 4C technology is ideal for a range of industries such as general fabrication, power generation, shipbuilding, structural, offshore and pipeline that use multiple welding processes, including Stick, MIG and TIG. Whatever the task at hand, 4C technology gives you a clear view to productivity and quality. DELAY CONTROL DARK TO LIGHT (SEC). 0.1 - 1.0 Fully Adjustable. DC > 2 Amp AC > 2 Amp. 4.5 in x 5.25 in (114 mm x 133 mm). 3.74 in x 3.34 in (95 mm x 85 mm). Operating: -10°C - +55°C (14°F - 131°F). Storage: -20°C - +70°C (-4°F - 158°F). We are an AUTHORIZED LINCOLN DISTRIBUTOR serving the welding industry for over 35+ years. The item "Lincoln Viking 3350 Hot Rodders Welding Helmet K4440-3" is in sale since Wednesday, May 30, 2018. This item is in the category "Business & Industrial\CNC, Metalworking & Manufacturing\Welding & Soldering Equipment\Welding\Welding Protective Gear\Welding Helmets".